Our beautiful SHADOW MOBILES are inspired by delicate branches of leaves. They cast gentle shadows onto the surrounding walls, animating a room in a poetic way. We design and manufacture in our atelier in Vienna, from dying the fabrics to screen-printing the logo details. The distinctiveness of our collection and our high-end way of manufacturing has recently won us the recognition of Rolls-Royce. We are proud to be part of their RREC Diamond Jubilee Showcase. OFTEN COPIED – NEVER REACHED! 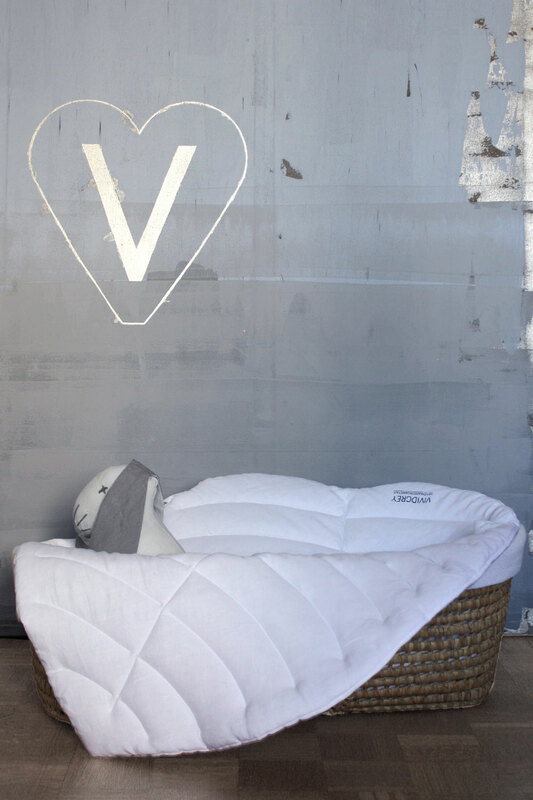 We started manufacturing our quilted linen leaves in 2013, just when VIVIDGREY was born. These signature pieces of our collection capture our brand values beautifully, combining poetic shapes with understated colours and crafted quality. With this new collection we bring mysterious little visitors into your home. Small traces of weasel paws and tiny sparrow feet are hand-printed on organic linen throws, cushions and table cloth. Welcoming new life into this world is at the heart of our collection. Our shop offers some pieces that are perfect gifts for a newborn – special bedlinen, play mats, quilts & soft toys. We like to bring summer inside our home with the most uplifting of all colours: Ultramarine. Our hand-painted throws, cushions and curtains are perfectly capturing the easy feeling of the long, sunny days we cherish so much. We believe in creating furnishings that are loved by all ages – children and grown-ups alike. Our pieces are created to grace a home for a long time, not just for a transient period in life. We draw inspiration from the VIVID imagination of children and balance it with the simple, grown-up sophistication of the colour GREY. These large drum shades are one-of-a-kind pieces. We paint each item by hand with pure plant paint in our atelier to create stunning effects that are enhanced when illuminated.